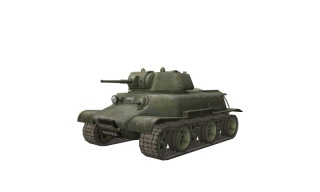 The MT-25 is a Soviet tier 6 light tank. A proposed project of a light wheeled caterpillar vehicle. The draft was completed in February 1943. The most innovative feature was the suspension design. The suspension wheels were interleaved, and power was delivered to all wheels. No prototypes were manufactured. The MT-25 leads to the LTG. Overall sub-par gun: below average penetration and alpha damage for all it's guns. Very low DPM @1600, worst out of all T6 Light by far except the AMX12t which however has an autoloader. The MT-25 too big for the most effective passive scouting, however its sheer speed allows for easy active scouting. Just like the Tetrarch, when the MT-25 moves over obstacles (fences, brick walls, etc.) it rapidly decelerates because of the way the suspension is designed. 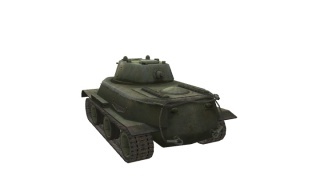 This tank's mobility is probably the strongest point of the vehicle, try to use it as much as you can. With a powerful engine, high speed limits, and great terrain resistance combined by good traverse speed, this tank outruns almost every opponent it faces, and deserves to bear the name of "pocket rocket". The MT-25's guns are usually considered lackluster when compared to those of its main opponents (eg T37). The 57 mm ZiS-4 has high accuracy and shell velocity but takes long to aim, lacks both penetration and damage per shot, rate of fire and the gun depression is less than stellar. Try to make the best use of your mobility by attacking isolated tanks and flanking them with your superior speed. When flanking and shooting the sides of enemies, regular AP shells are usually enough to do the job. Since accuracy is high, you can try flanking opponents and shooting their sides at longer ranges as well. Alternatively, if they are in another light tank or a light TD, you can finish them with a ram many times due to quick speed and fairly heavy weight. Early on in the game before you do this, try to do passive scouting or mainly active scouting. Although view range and camo are outclassed, the speed allows you to quickly get to positions or duck from cover to cover before other rival scouts and you can help your team a lot. First research the MT-25 reinforced Suspension. Next, research the V-16 Engine. The last engine should not be missed as it really brings out the supreme mobility of this tank. Finally, research the R-113 Radio. Difficult battles of the Soviet-German front in 1941-1942 negated the advantages of light tanks. Equipped with relatively weak weapons and mostly bulletproof armour, light tanks as a class were becoming obsolete. The Germans were the first to see the end of the pre-war concept of a light tank, ceasing production in 1942. In the USSR, engineers were still trying to boost the combat performance of the T-70. The result of this work was the T-80 tank, but it came too late. Meanwhile, proposals for radically new light tanks arrived. 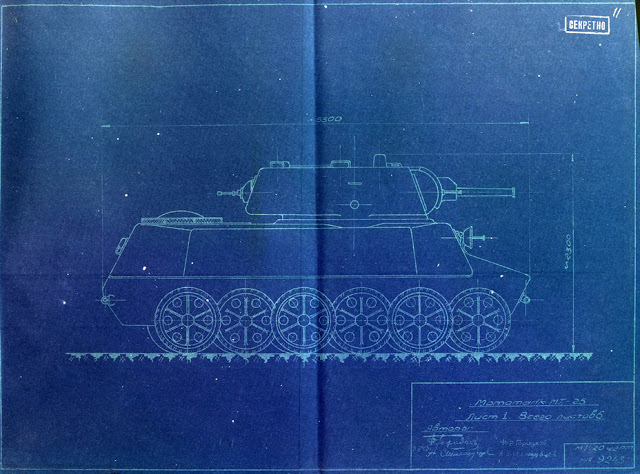 A proposal for the MT-25 tank was sent by Chelyabinsk engineers to Stalin on February 24th, 1943. Unlike many proposals, this one contained interesting ideas and was well thought out, and piqued the interest of the Main Armoured Directorate. What were these ideas, and why was the tank never built? One of the main problems with the T-70 and its predecessors was that there was a very small resource for modernization. The tank widely used automotive parts which were simply unsuitable for the loads of a tank. The mass of the T-70 could not exceed 10 tons for this reason. The later T-80 grew to 12 tons, and that was also the limit. The capacity for supercharging the engine was exhausted, and any further increase in weight would have a negative effect on reliability. In addition, the T-70 was very small. 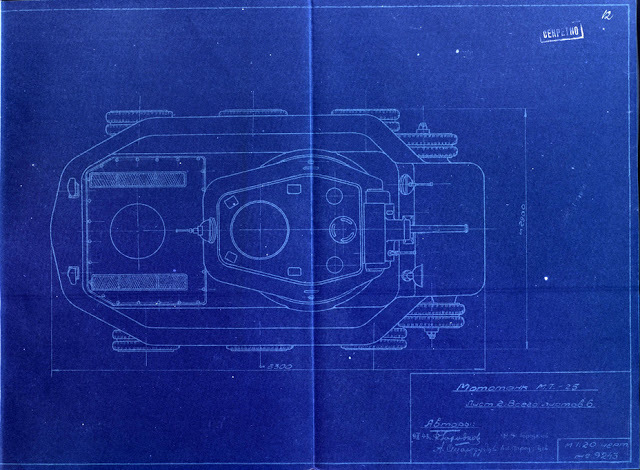 In order to fit in a two man turret, the GAZ design bureau headed by N.A. Astrov had to apply a titanic effort. It was impossible to install anything bigger than a 45 mm gun, and the long barreled VT-42 gun was never put into production. The two-man turret made the T-80 more difficult to service, and the engine was now very close to the loader, which did not make his job comfortable. It is not surprising that GABTU began looking back at the T-50 in the spring of 1943, a project which was only completely shelved in early 1942. MT-25 from the side. At 25 tons, it was only 10 cm longer and 10 cm taller than the 14 ton T-50. "To the Chair of the State Committee of Defense of the Union of Soviet Socialist Republics, I.V. Stalin. 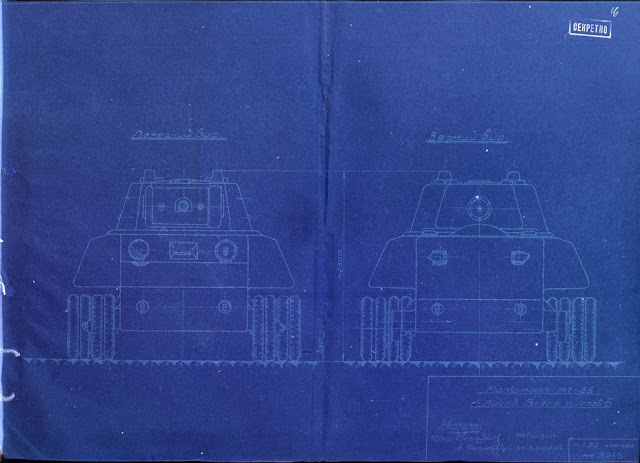 Fulfilling our duty to the Motherland in this period of relentless and heroic struggle of the Soviet people against the German fascist occupants, and protection of our honour, freedom, and independence, we developed blueprints of a new combat vehicle. 2. Low damage as a result of being hit. 4. Ability to suddenly attack the enemy. The vehicle we have developed is called MT-25, and is a wheeled vehicle, with every wheel being a drive wheel. 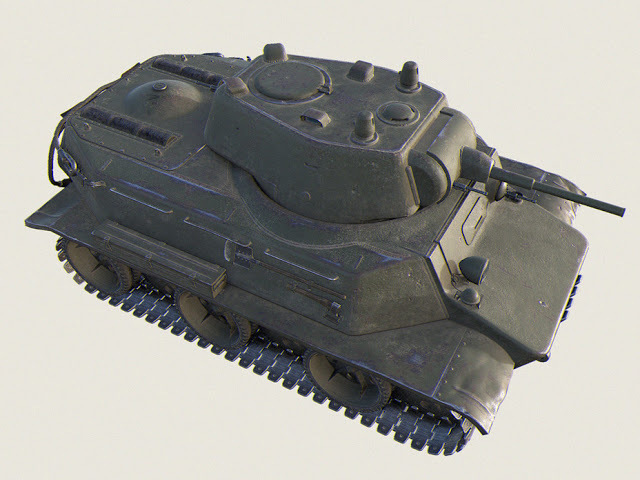 If tracks are added, the MT-25 becomes a tracked vehicle. The vehicle's mass is 25 tons. The average speed is 40-45 kph, maximum 100 kph. Since every wheel is a drive wheel, the vehicle is very survivable. Even if half of the wheels are disabled, the vehicle does not stop. When the engine uses a muffler, the vehicle moves silently. Armament: 47 mm gun and 3 machine guns. We ask you to consider our proposal and accept it as a gift in honour of the Red Army's 25th anniversary. At the time, a torrent of various proposals came at GABTU and other organizations, including proposals for tanks. GABTU's Department of Inventions reviewed dozens of them. Some of them, like Lieutenant Provornov's light tank (LTP) were rather interesting. Meanwhile, the invention with the aforementioned memo can be found in GABTU's main repository, which means a great deal of attention was paid to it. The authors of this proposal were engineers F.F. Gorodkov and A.I. Starodubtsev from Chelyabinsk. They worked at the interesting factory #200. This factory, separated from factory #78 in 1941 (modern day OOO Stankomash) specialized in the production of KV hulls and turrets, which were sent to the Chelyabinsk Tractor Factory (ChTZ). Factory #200's design bureau worked closely with the ChTZ design teams, which contained many engineers that used to work at the Kirov factory in Leningrad. In addition to KV parts, factory #200 built orders from the design bureau of experimental factory #100. The MT-25 was even wider than the T-34. Factory #200's engineers had impressive experience. Perhaps this is why Gorodkov and Starodubtsev's invention was rather extraordinary and had a series of novel solutions. 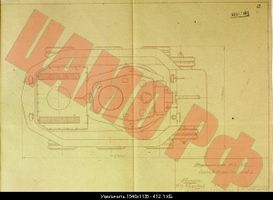 As the authors wrote in the foreword to the draft project of the tank they called "Mototank MT-25", technical literature and manuals from the KV-1 and T-34 were mostly used during development. 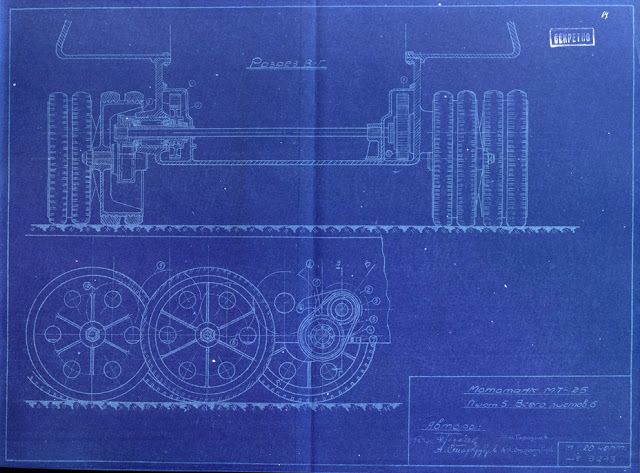 "Existing tank designs largely consist of tracked tanks, where the drive sprockets are elevated and the road wheels are not powered. 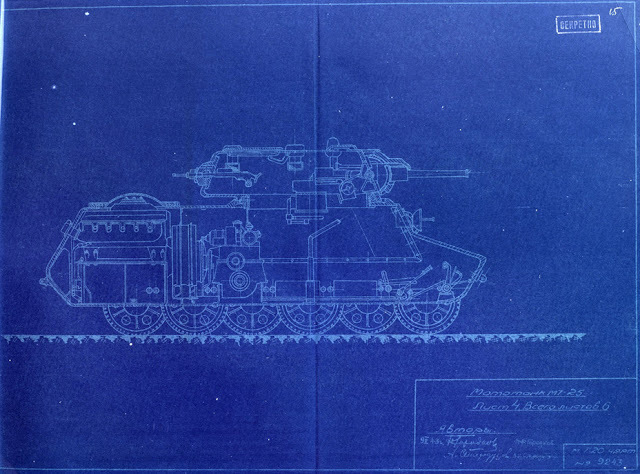 The drawback of this design is that if the tracks are destroyed, the tank loses the ability to more, even though its internal mechanisms remain undamaged. In battle, an immobilized tank is as good as a destroyed tank. The new type of combat vehicle that we propose, the mototank, is free of the aforementioned drawback. The mototank is a wheeled, and if necessary, tracked, fighting vehicle, where all the road wheels are powered. If the track or a portion of the wheels are destroyed, the tank does not lose its ability to move and can still fight the enemy or, if necessary, evacuate on its own power. The vulnerability of the suspension of the new vehicle is drastically reduced. It can live and fight for as long as the engine runs. Existing designs of tracked armoured vehicles are limited in speed to 50 kph, and only convertible drive tanks can reach a speed of 70-75 kph. The mototank retains a valuable quality of wheeled vehicles: high speed of movement and maneuver. When driving on wheels, the mototank can reach a speed of up to 100 kph, or 40-45 kph on average. The design characteristics of the "MT" class allow light, medium, or heavy tanks of this type to be built. The area of application of the "MT" concept is unlimited and is only dictated by the strategic ideas of high command." 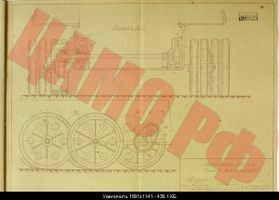 In other words, Gorodkov and Starodubtsev suggested the return to a convertible drive tank, one where the wheeled mode, in their opinion, was the main means of movement. On difficult terrain, chain tracks like on the ZIS-33 truck could be used. One could think that the engineers did not come up with anything new, but this is not the case. On one hand, the ideas of convertible drive tanks with power to more than one axle already existed. N.F. Tsyganov worked a lot on this idea. In the spring of 1934, he began working on the BT-2IS tank, which had power to the second, third, and fourth pairs of road wheels. The maneuverability of this tank was higher than the regular BT-2, but the massive system of shafts was not very reliable. Further development of Tsyganov's design was used on the BT-5IS, BT-SV, and A-20 tanks. Front and rear views. The MT-25 had large bustles above the tracks that could be used to store fuel or ammunition. However, the Chelyabinsk proposal differed radically from what Tsyganov envisioned. The BT-2IS and similar tanks transferred power through drive shafts. The MT-25 had a gear system that ran along the side of the tank. It took up less space and was more reliable. In addition, it could power all the road wheels at once. 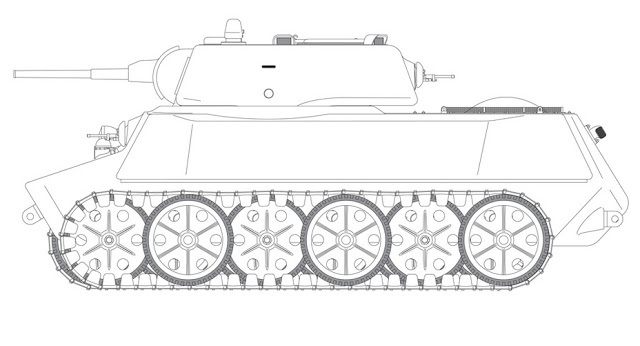 In addition, as on the KV-1, the MT-25 used a torsion bar suspension, unlike coil springs on the BT-IS and A-20. This radically reduced the volume inside the tank that was taken up by the suspension. The new project also had no turning wheels. Gorodkov and Starodubtsev let the MT-25 turn like a tank, with the aid of final drives and friction clutches. Suspension and drive gear layout. The running gear of the MT-25 consisted of six doubled up 700 mm wheels per side, without idlers or return rollers. The wheels were interleaved, which was a first in Soviet tank building. It is not known if the designers came up with the idea themselves or saw a German halftrack. Either way, German halftracks used a different layout. Close up view of the suspension. This was not the end to the unusual design decisions. The hull looked quite interesting, which is not surprising given that it came from factory #200. Work on an improved IS-1 (KV-13) was underway in early 1943, and the new design used casting extensively. The MT-25 used even more casting. The rounded shape of the MT-25's hull suggests that few rolled parts would be used. 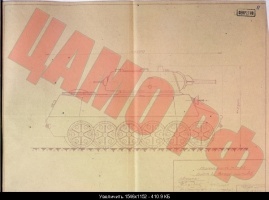 Since the Izhor factory successfully cast KV-1 and T-211 hulls in the fall of 1940, the use of this technology to make a light tank hull was very much possible. The only steps left would be to weld on a roof for the fighting and engine compartments. The thickness of the armour was 40-45 mm, same as the T-34. 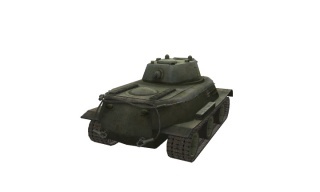 The authors of the MT-25 compared their tank to the T-34 several times, but the 45 mm gun (47 mm in the description) suggests that they thought of their design as a light tank. The short hull, only 5.3 meters, 10 cm more than the T-50, also implies this classification. The non-standard suspension influenced the layout of the tank. The engine and transmission were in the rear, but the transmission was in front of the engine instead of behind it. This allowed the length of the hull to be reduced. Of course, removing the transmission became more complicated, but it was possible to service the gearbox and final drives without exiting the tank. The decision to move the transmission forward was dictated by the drive wheel requirement. The gearbox bulged out slightly into the fighting compartment, but did not take up much space. 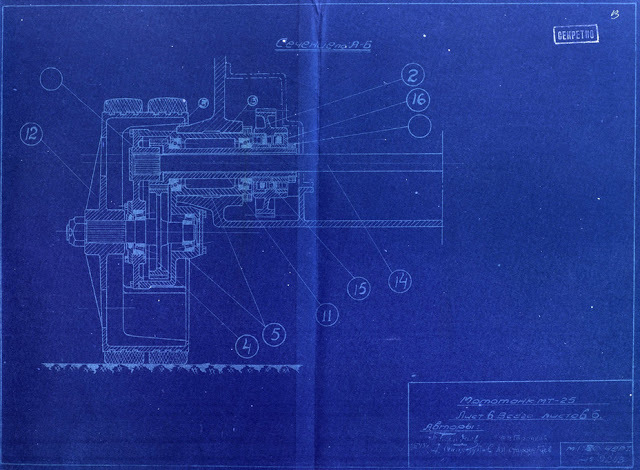 The V-2K engine was chosen for the MT-25, giving the tank an impressive 24 hp per ton. The claimed speed of 100 kph was doubtful, but characteristics on the level of the A-20 were attainable. Cutaway of the MT-25. There is a lot of room, even for a medium tank. The fighting compartment was large even for a medium tank. Thanks to the wide hull (the tank was 2900 mm wide) and lack of massive suspension elements in the sides, there was a lot of room in this small tank. This let the inventors estimate an optimistic 300 45 mm shells for the vehicle's ammo rack, and 120 disk magazines for the machinegun. This is a rather bold evaluation, but looking at the volume available above the tracks, it does not seem too far fetched. The number of crewmen was not specified, but the similarity of the turret to the KV-1 and the slightly larger turret ring diameter (1570 mm) suggests that a commander, gunner, and loader could fit in the turret. There was enough room to install a 76 mm gun. The driver and radio operator were placed in the driver's compartment in the front, as on the KV-1. The MT-25 was reviewed, but no conclusions were ever made. On one hand, the layout was very bold, and there was nowhere this kind of tank could be built. On the other hand, the amount of work put into this design was high, and it stood head and shoulders among similar inventions, which were largely conceptual. The MT-25 was stuck in limbo, both as an unrealistic and rather interesting project. There was another reason why Gorodkov and Starodubtsev's proposal did not end up in the Department of Inventions. Conceptually, the tank was perfect for the tactical-technical requirements for a new light tank that were developed in the spring of 1943. Initially, GABTU tried to revive the T-50 by installing a 76 mm gun, but the mass of the tank rapidly reached 20 tons, then 22 tons, and finally reached the same value of 25 tons. Soviet designers weren't the first to hit that mass with a light tank. The pioneers here were Germans, whose VK 16.02 Leopard tank became almost that heavy, at which point work on it was stopped, since it started to resemble a medium tank. The Americans were next, whose 14 ton light T7 tank grew into the 25 ton M7 Medium Tank. Work on it also stopped, but already in production, since it was obvious that the American army did not need another medium tank. The 25 ton limit for light tanks surfaced many times after the war. Many French and American designs ended up with a similar weight. One tank that was almost as heavy (M41 Walker Bulldog, 23.5 tons) was even put into production. 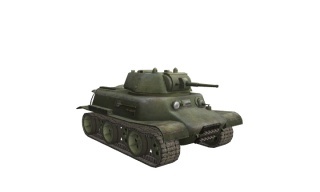 Reconstruction of the MT-25 in World of Tanks. The rapid growth in penetration of tank and anti-tank guns in late 1943 forced tank designers to drastically increase the level of protection. Requirements for light tank armour thickness surpassed even those that were set for medium tanks before the war. The USSR bet on the revival of amphibious tanks with significantly more powerful armament. That is how the PT-76 came to be. The US initially picked lightly armored, but mobile and well armed tanks (Light Tanks M24 and M41), but also eventually made amphibious tanks (M551 Sheridan). A mass of 25 tons was too bold for 1943, since tanks with that mass were still classified as medium. If the weight limit on light tanks was raised to this level, the concept of a cheaper, lighter, and more mobile tank than a medium tank, but with comparable armour and armament, could have been successfully developed for another few years. Of course, history doesn't know the word "if". The situation in Soviet tank building in 1943-1945 left few chances for the MT-25. At 25 tons, the equipment necessary for building this tank would be the same as for the T-34. The new tank with an uncertain future was left without anywhere to build it. None of the current armaments were ever proposed for the MT-25. The MT-25's only planned armament, a 47 mm gun, is missing. Planned average speed was 40-45 kph, maximum 100 kph. This page was last modified on 1 August 2018, at 11:11. This page has been accessed 33,101 times.